Do Thyroid Stimulating Hormone Levels Change After Gastric Bypass Surgery? Background: Thyroid function is important for adequate metabolism. Studies have shown obese patients to have higher levels of thyroid stimulating hormone (TSH) than non obese patients. Evidence suggests an association between high TSH values and metabolic syndrome which is demonstrated when TSH and weight reduction leads to decreased insulin resistance. 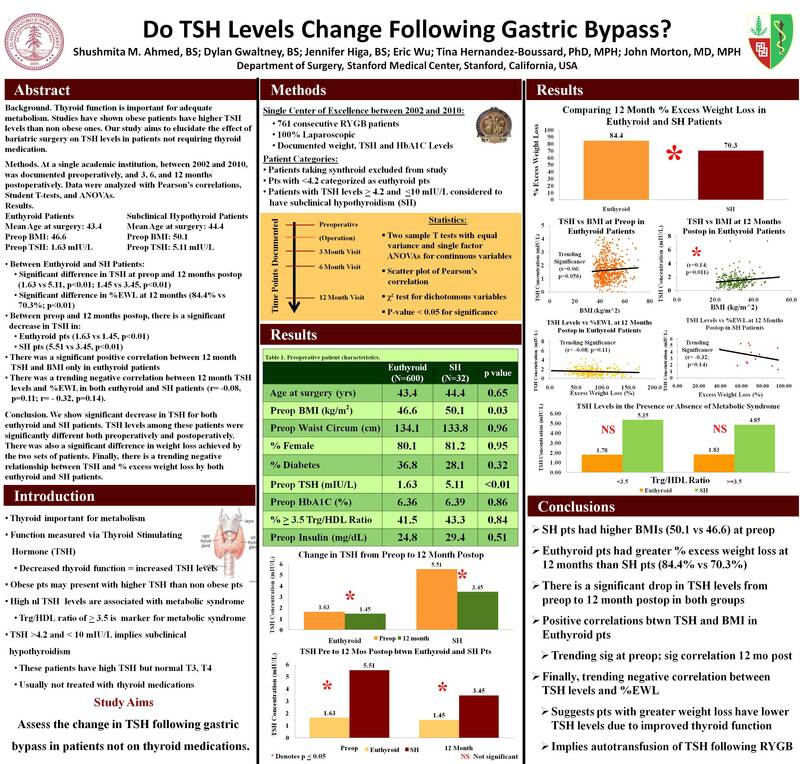 Our study aims to elucidate how gastric bypass surgery affects TSH levels. Methods: At a single academic institution, between 2002 and 2010, we documented TSH and hA1C levels preoperatively, and 3, 6, and 12 month postoperative visits. Data were analyzed with Pearson’s correlations, Student T-tests, and ANOVAs as appropriate. Results: Preoperatively, the mean age of 1111 patients was 44.3 years; the mean body mass index (BMI) was 46.4 kg/m²; 82% were women; 78% were women; 55.6 % were hypertensive; 37% were diabetic; 42% had obstructive sleep apnea; 13.5% were on thyroid medications; mean TSH was 1.86mIU/L; and mean hA1C was 6.33%. There was a trending difference in TSH between patients on and patients off of thyroid medications (1.81 vs. 2.18, p=0.055). There was a significant correlation between preop BMI and TSH for both patients on and off thyroid medications (r=0.304, p<.001; r=0.131, p<.001). There was a significant correlation between preop TSH and preop waist circumference for those on thyroid medications (r=0.306, p=0.022). There was a significant negative correlation between age and preop TSH for those on thyroid medications (r = – 0.195, p<0.014. There was a significant negative correlation between preop TSH and 12 month excess weight loss in patients on thyroid medications (r= -0.324, p=.002). There was a significant difference between preoperative and 12 month TSH in patients off thyroid medications, but no difference in those on medication (1.80 vs. 1.55, p<0.001; 1.74 vs. 3.69, p=0.095). Finally, there was a significant correlation between 12 month TSH and 12 month percent excess weight loss (% EWL) for those on thyroid medications but only a trending correlation in those off of medications (r=0.296, p=.006; r= -0.088, p=0.060). Conclusion: Our study shows a significant decrease in TSH 12 months following bariatric surgery in patients not taking preoperative thyroid medications. Higher levels of TSH were associated with greater BMI in both patients on and off medication. Finally, TSH levels can serve as an indicator for surgery weight loss.